who knew that with a busy schedule one just runs in circles forgetting that they joined a challenge! Today I am just really working on cleaning out the overwhelming crud out of my office closet. What doesn't get donated to charity will be recycled. Old printer and some computer parts that I don't even remember what I got them for will be donated to the local school. Other stuff will recycle. Either way it will not be taking up personal space in my office. I suppose that I am going to declutter the house eventually. Part of down sizing and simplifying things. Taking care of the psychic pollution as well as making it easier to open that closet without ducking things falling on my head. 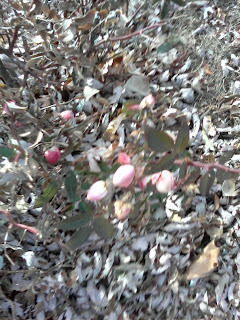 The picture is of a cold hardy rose in my front yard. Making a valiant attempt to bloom even after a couple weeks of cold nights and snow happening on and off. Last year it bloomed until almost the end of November. If it has nice days perhaps it will again.